This piggyback kydex carrier is hand made, of moulded kydex. 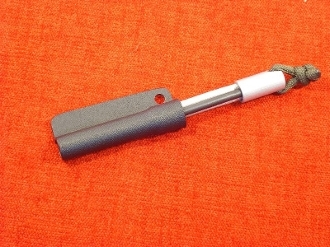 It holds the tops emergency 3 rod fire starter and has 2 mounting holes. The top hole is pre-made and the second hole is left for you to make. This way it will fit your own sheath. The piggyback comes with 2 mounting screws, and fits most manufacturer's kydex sheaths. The piggyback setup holds close to the body of the sheath. The firestarter can be pulled out for use fairly easily. This does not require great technical skill. However if you don't know how to use a small wrench... Don't buy it....you can wear the firestarter around your neck instead. This is an interesting innovation for guys who like piggybacking their gear. ...And most of all...if you’re in an emergency situation....you'll be glad you have it available.